A California store's security camera captured the moment an e-cigarette exploded inside a man's pants pocket, severely burning his leg. Antelmolare Guzman, a manager at the HDTV Outlet store in Anaheim, said a customer was at the store on Saturday looking to buy a new television. After choosing a model, Guzman said he went to the front of the store to draw up paperwork when he heard an explosion. "We turn around and all we see if smoke and something caught on fire," Guzman recalled. "The gentleman, he is running out to the front of the office, and he is screaming and yelling. Apparently, all of his right leg was completely burnt all the way down. Part of his private parts were also kind of affected with the whole fire thing." 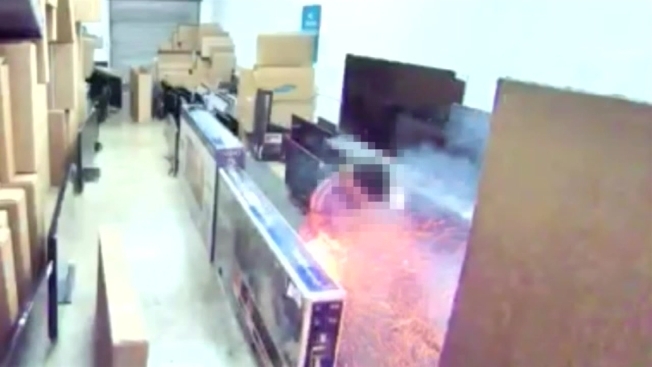 The customer, 24-year-old Mohamad Zayid Abdihdy, said he was taking measurements of the television when he felt a shock in pocket and the device started to burn him. 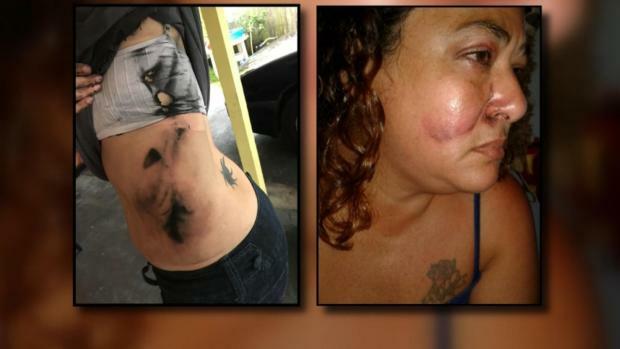 A Tampa, Florida, mother claims the battery in her vape pen exploded in her purse, narrowly missing her 3-year-old daughter and leaving her and a relative with second-degree burns. WFLA-TV's Corey Davis reports. "Basically, it blew up in my pocket," Abdihdy said. As Abdihdy ran into the restroom to attend to his burns, Guzman rushed to put out the electronic cigarette, which was still alight on the store's floor. "It was really scary, the explosion and the fire and with all the parts that we have — we have boxes," Guzman said. "The area that we're in is an industrial area, so it could have easily caught fire." Guzman added that air inside the store smelled of "burnt skin." And despite his painful wounds, Abdihdy said he drove himself home and did not go to a hospital. He said his cousin went to a pharmacy and bought medicine for his scorched skin. Abdilhdy, who is a cell phone store worker, said he was burned and in pain as a result of the incident. "I can't walk on my leg, honestly," said Abdilhdy, who works at a cell phone store. "That's how much I'm in pain." Asked if he'll continue to smoke e-cigarettes, Abdihdy responded: "I'm going back to hookah." The store manager said he's happy the customer was not more seriously injured and the e-cigarette did not explode near his face, but the incident has changed his view on e-cigarettes, too. "As far as vaping itself, I consider it very dangerous now that I've seen it with my own eyes," Guzman said. The incident also gave Guzman an idea for a new sales pitch for the store: "Come see us, please. We've got everything discounted. There are literally exploding deals!" Rima Abdelkader contributed to this story.